When you’re on the move, and you just need to quickly print some photos, you’re going to want to look at the best portable printers. You can forget about printers being big, bulky and beige devices that need 20 different wires. Modern printers are more flexible than they’ve ever been. Many have wireless connectivity, allowing you to print from almost any device without having to worry about trailing cables everywhere. There’s also a class of portable printers that are battery-powered, allowing you to easily take them with you wherever you want to go. With this guide, we’ll show you all the best portable printers you can buy today. By using inkless thermal print technology, which relies on fewer moving parts, Brother has reduced this portable printer to the size of a small baguette. What’s more, the only consumable you need is the special thermal paper itself, making this pocket-sized device perfect for taking on the road, or carrying onto a plane. It comes with both power adapter and battery pack, so you can use it anywhere and while Wi-Fi is built in, you don’t need to rely on finding a network to connect with your device because it also offers Wi-Fi Direct and a mini USB port. It prints, quickly enough with the black and white pages emerging as sharp and detailed as any laser printer. HP has managed to shrink the inkjet printer to the size of a cigar box while adding a battery compartment. The result is a highly portable device that can turn out crisp colour documents at a rate of 10 per minute in mono, or 7 in colour. There’s no duplex mode, unsurprisingly, but it can handle envelopes and photo paper and photo paper of any size up to A4. With Wi-Fi Direct and a USB port available, you really can print from anywhere with this ingenious device. This inkjet printer is small enough to fit in a bag or large briefcase and comes with a battery pack as well as power cable so you can print colour documents on the road. You can connect to it via Wi-Fi, Wi-Fi Direct, or USB and it supports AirPrint, Google Cloud Print and Canon’s own Pixma Print for easy cloud operation. There’s no auto duplex mode, but in other respects, this miniature printer is uncompromising. It uses five ink cartridges to achieve superior colour fidelity when printing photos, for instance and at nine pages per minute, it’s not too slow at printing black and white pages either. Epson’s latest portable inkjet printer is the world’s smallest, fitting easily into a briefcase. It is also the only inkjet we know of that can be powered over USB, making it ideal for travelling. The battery should deliver up to a 100 mono pages on a single charge while a single set of pigment ink will yield up to 250 mono pages and 200 colour. Wi-Fi and Wi-Fi Direct make it possible to connect wirelessly without a network, while compatibility with AirPrint, Google Cloud Print and Epson iPrint simplify mobile printing. This small and stylish inkjet requires a power point as there’s no battery option, but in all other respects, it’s the perfect portable printer. Weighing just 6.5kg, it fits easily in a bag and the ‘X’ edition seen here includes a fabric cover to protect it in transit. It also acts as a mat to catch your printed paper. There’s no inbuilt scanner but the excellent companion app can harness your smartphone’s camera to grab, straighten and copy documents. It’ll print on envelopes or photo paper of any size up to A4 and turn out pages at reasonable rate of 11ppm. HP has dispensed with the USB port altogether because its wireless skills include everything from Wi-Fi and Bluetooth, to AirPrint and Google Cloud Print making it perhaps the most flexible device for cloud printing that we have come across. 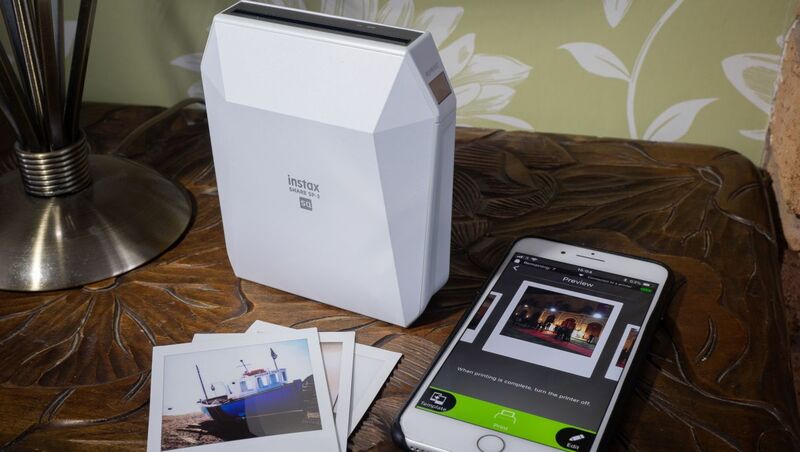 This (almost) pocket-sized printer is probably the easiest way to turn photos on your smartphone, or your Instax camera, into physical prints. Using an evolution of the technology used in Kodak’s instant cameras, Fijifilm’s inkless system sears the image onto square format photo paper. Neither the printer, nor the paper are cheap and the printer itself has few features other than Wi-Fi. Nonetheless, the photos it produces are colourful and accurate, if a little soft and pale. It has to be the most rewarding way to turn a great photo into a physical momento that can be passed around and stuck to the wall. Polaroid’s Zinc (zero ink) technology is used to great effect in this highly portable and well thought-out printer. It is slim enough to slip into a shoulder bag and weighs only 162g and most of that weight belongs to the 900mAh battery. The Polaroid photo paper is rather expensive and limits you to 2×3-inch prints but the results always look colourful, detailed and charmingly retro. And no, shaking does not make the image develop faster. Don’t confuse this pocket-sized device with the retro photo printers from the likes of Polaroid and Kodak. This is strictly business and prints only in mono on thin thermal paper that happens to be a similar size to the Instax film. It can hold a pack 50-sheets, connect to your device via Bluetooth and prints quietly at a resolution of 300dpi. It’s perfect for issuing or copying receipts on the go for example and is engineered to survive on the road with a battery that should last for about 100 pages. HP Sprocket Plus turns out slightly larger prints than its Sprocket predecessor and its immediate rivals, while the device itself actually got thinner and lighter. By using Zink technology, you don’t need ink, but you are dependant on HP’s thermal photo paper which has a sticky backing and come in packs of ten. With the Sprocket app and a Bluetooth connection to your smartphone, you can print colourful and creative photos wherever you are. The lithium-ion battery is good for about 30 prints at over 300dpi resolution. This portable printer could almost slide into a jacket pocket and yet it is capable of printing onto A4-sized paper. By using thermal imprinting, instead of impact printing which requires ink and many more moving parts, this battery-powered device requires no consumables other than the special thermal paper. What differentiates this model from most portable printers is the addition of MFi (Made For iPhone) making it easier to sync with Mac and iOS devices over Bluetooth. With a battery that lasts for 100 prints and no ink limitations, you really can print from anywhere with this rugged and highly portable device.